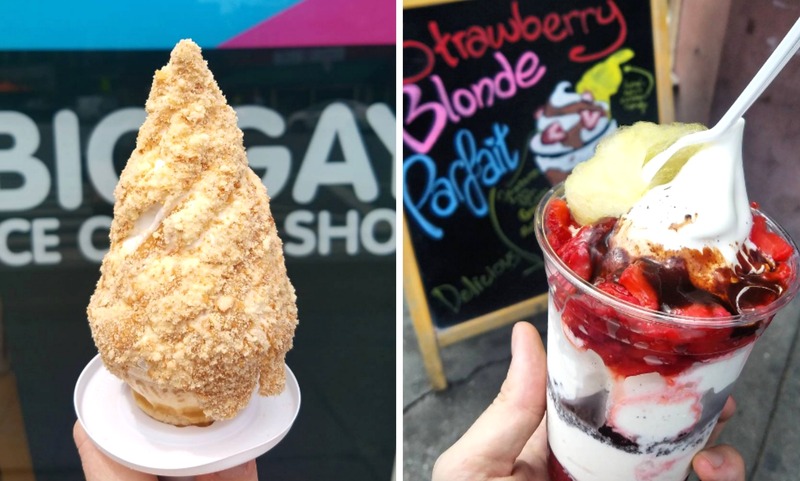 If you’re walking on East 7th Street between 1st Avenue and Avenue A or in the West Village on 7th Avenue near Christopher Street and see a long line on the sidewalk coupled with smiling faces walking by with ice cream cones, you’ve found Big Gay Ice Cream. The two shops are places where ice cream is not scooped, but swirled, in offerings that have become famous not only for their imaginative ingredients, but their fabulous names. There’s the Bea Arthur, named after the “Golden Girls” actress and activist, comprised of vanilla ice cream, dulce de leche and crushed ‘nilla wafter; the Cococone with chocolate ice cream and toasted curry coconut; and perhaps their most well-known, the Salty Pimp, made up of vanilla ice cream, dulce de leche, sea salt, and a chocolate dip. 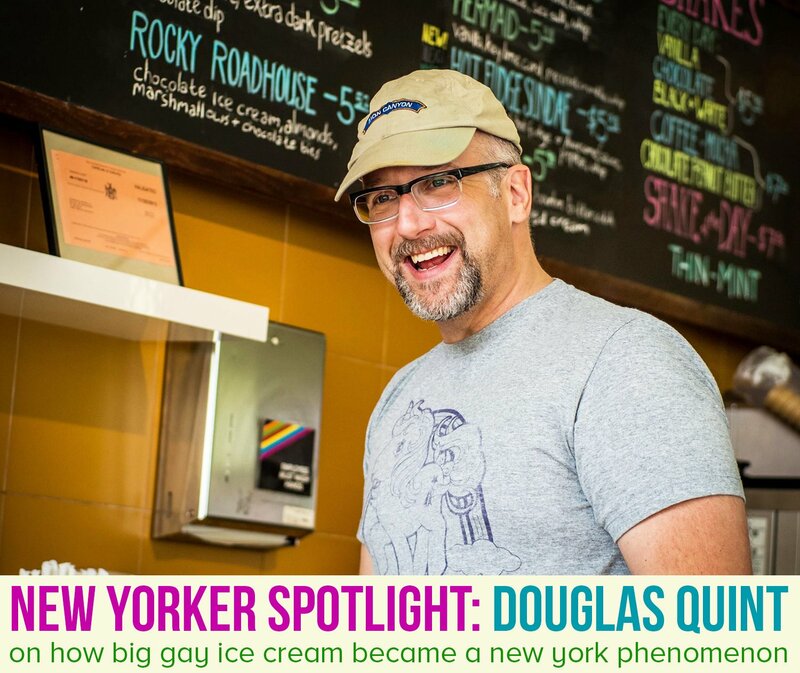 One of the visionaries behind Big Gay is Douglas Quint, who, along with Bryan Petroff, founded the business in 2009. 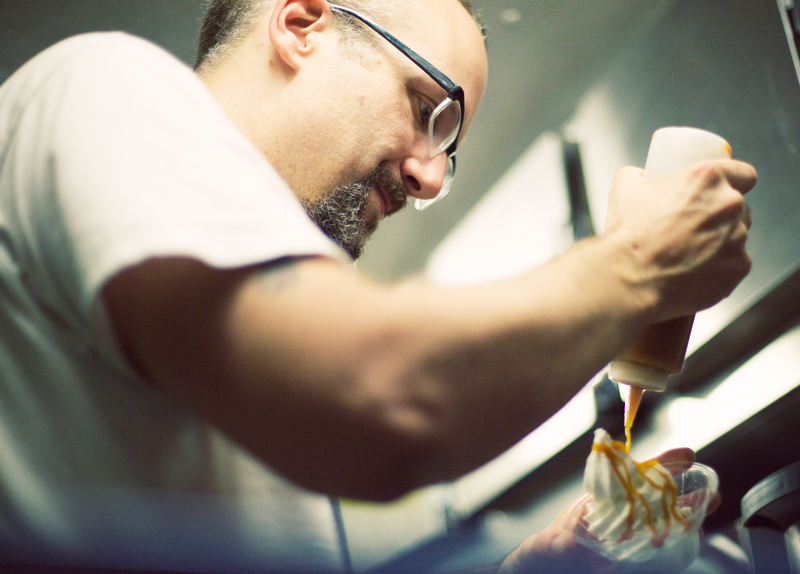 While it started out as a summer experiment when the two opened an ice cream truck, it quickly developed into something much bigger (a third location recently opened in Philadelphia and the duo published a cookbook last year). 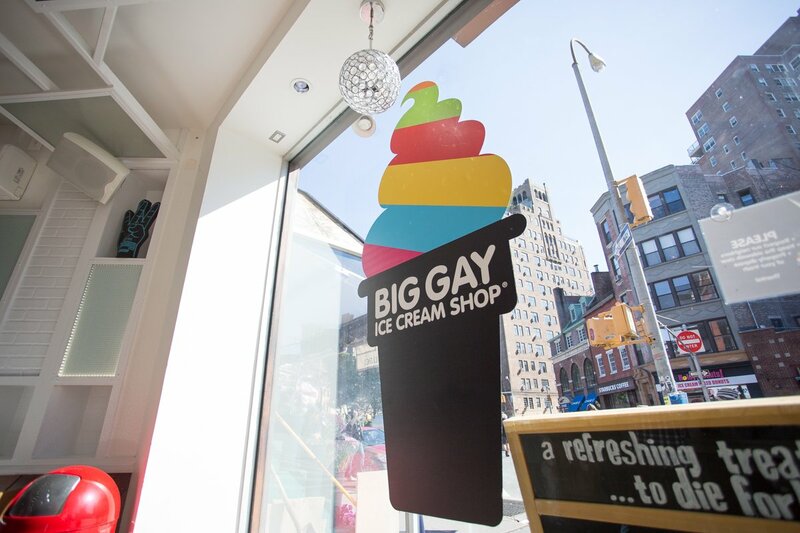 6sqft recently spoke with Douglas to discuss all the magic that takes place at Big Gay, including how the flavors come to be, their three locations, and the best time to stop by for a cone. 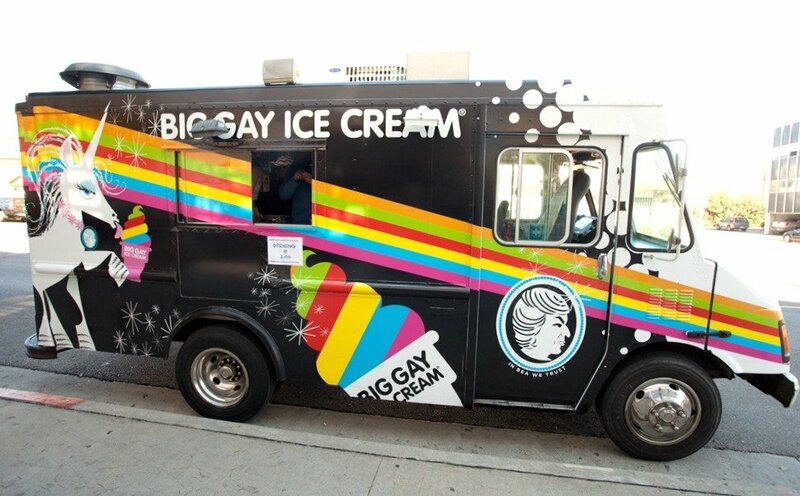 Tell us about the origins of Big Gay Ice Cream? 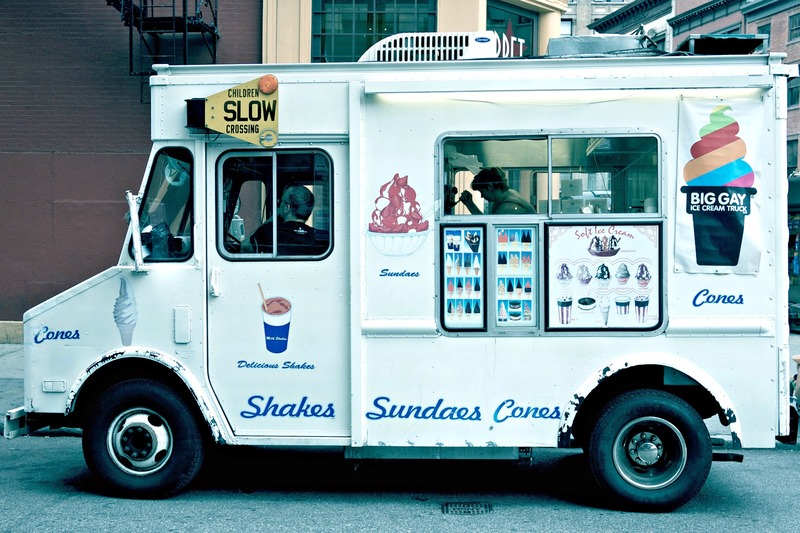 We got a truck and figured it could only be vanilla and chocolate ice cream, so it was all about what toppings could we put on it because Mr. Softee still has the same exact toppings that it’s always had. There’s no real interest in food by the people who run Mr. Softee. Their interest is in selling lots of Mr. Softee, and we wanted to up the menu because soft serve is awesome, and vanilla and chocolate are perfect. We started in June 2009, and it never even occurred to us that we would make it beyond that summer. It was just a funny thing to do. But once we saw how successful it was, then the idea of conquering ice cream came along. To what do you attribute this unexpected success? We didn’t do anything that first month; we just sat there. Then people started showing up because the ice cream was inexpensive, and it was fun to go on Twitter back then and find news, find stuff about food trucks, find whatever. Twitter was a brand new thing, so I think we were the zeitgeist of a few different things. It was a recession, there was Twitter, there were food trucks, and they all hit at the same time. I wasn’t so surprised at our initial success because I knew we had our timing right, but after a month or two, lines just kept building and building, and that’s when we had no idea what was going on anymore. The lines were even bigger the second summer. The baby was no longer in the crib; it was rolling down the street. When you decided to open a store, why did you go with the East Village and then the West Village? We wanted to be on East 7th Street, specifically on that block. It had a write up in the Times for what an amazing food block it is. We had friends with restaurants there, and people we met through food trucks had restaurants there. The perfect space happened to open up at the perfect time and it was the perfect price. It was the perfect everything. One of the great things about many of the restaurants on East 7th Street is that they’re stands essentially, like Luke’s Lobster, where you take a lobster roll and walk down the street eating it. So we thought that really translated the experience of being at our ice cream truck. Our shop is so narrow and small that you have to wait outside, and then you get ice cream and take it down the street, which is what an ice cream truck does. There’s no better advertising for stuff like ice cream than people walking down the street, because if you see somebody walking with an ice cream cone, you think, “Oh, let me have one of those.” There aren’t really any other foods that act like that. We had no idea that the West Village store would ever have a line, but surprise, surprise. That corner had a curse on it until us. I remember it being a bunch of different things. It’s especially funky and right now, there’s three corners on that intersection that should have businesses, and we’re the only one with something in the space. Is there ever a time when there’s not a line out the door during summer? The best time is during dinner from five to seven. People come in the afternoon, but when dinner time is happening things are pretty slow. Whenever we do a food festival we always say come to us first because people will go off and eat everything else and then decide they want ice cream. If you ever go to a festival, go to the desserts first and then go get the savory stuff after people have moved on from it. You’re going to gorge yourself, who cares what order you eat it in. Since you opened, there have been more independent ice cream store opening up in the East Village. 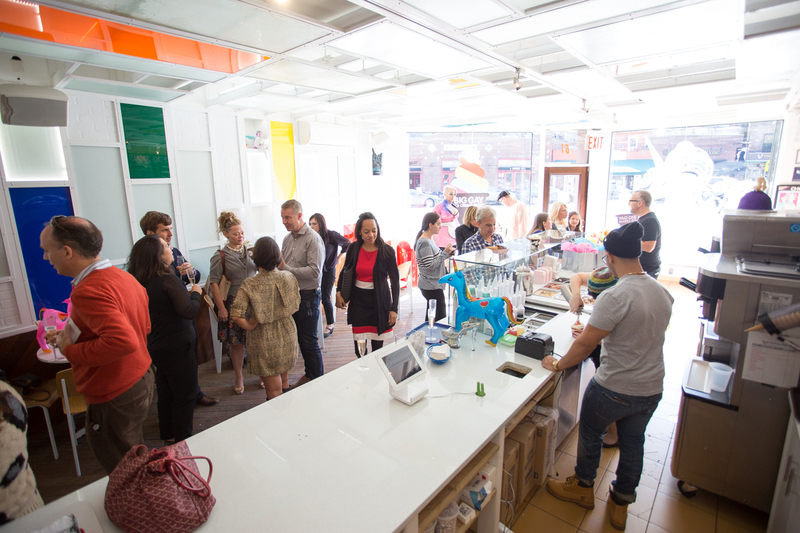 How do you feel about the neighborhood becoming an ice cream destination? There’s Van Leeuwen that opened almost at exactly the same time as us. There’s Davey’s Ice Cream that opened a few years ago and Mikey’s, which opened maybe a year ago. I think that good food and good restaurants beget good food and good restaurants. They attract people who are eaters and ice cream fans to the neighborhood, and there’s room for plenty of us. We’ve never lost business because Mikey’s came in or because Davey’s came in and they’re two blocks from us. Davey’s is doing great. They’ve got lines outside. One of the reasons I wanted to open a store in Philly is because Philadelphia has a couple of really great ice cream shops. It wasn’t because we wanted to compete with them, it was because we wanted to be comrades with them and turn people into ice cream eaters. What was that experience like opening in Philadelphia? It’s rather strange honestly to have ice cream cones going on that far away. 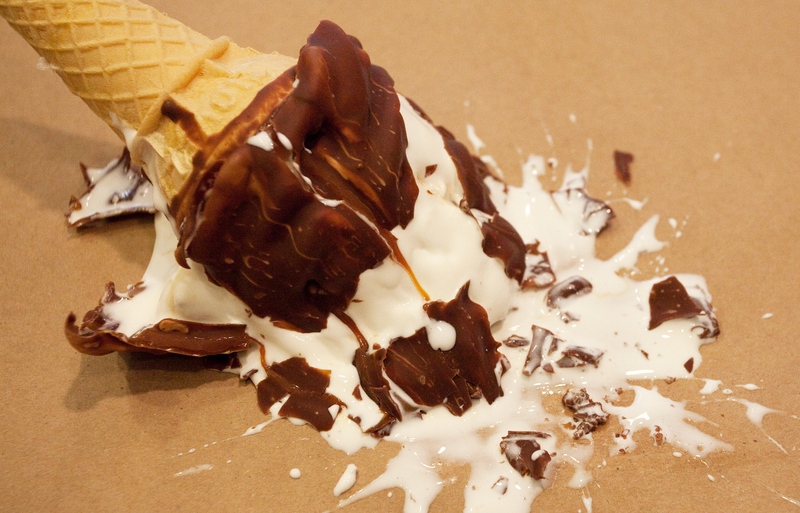 I still get weird when I walk down the street and see somebody eating one of our cones. I think, “Oh my god, there it goes. 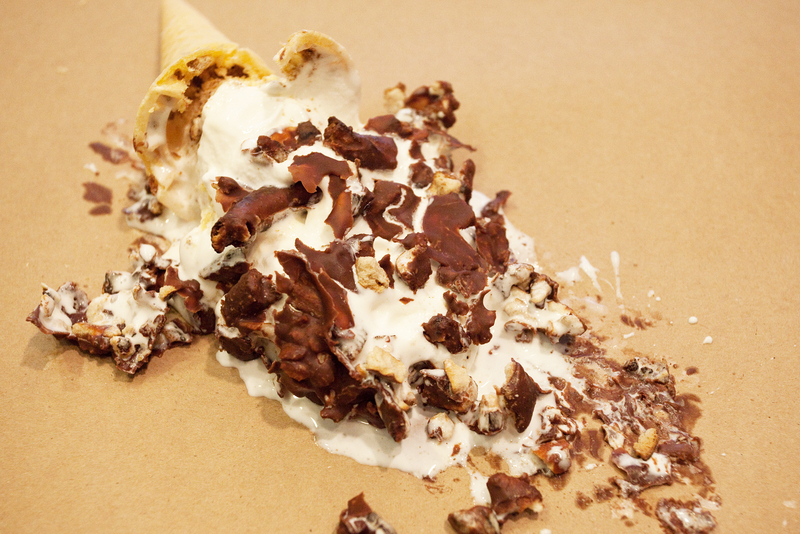 I didn’t make it.” There are staff and they’re making our cones. In the ice cream truck I made every single thing, so for a couple of years, everything that you saw in the truck was made by my hands. When the East Village opened, I saw somebody walking down the street and I genuinely kind of flipped out. Do you plan on expanding to other cities? We don’t have concrete plans to open anywhere else. We want more in Philly and in Philly’s outreach. As far as other towns, of course we want to be other places. I don’t know quite where yet. We move at the speed of a sludge. How do you come up with your flavors and their names? Is there one flavor that you think epitomizes New York? American Globs. It’s really, really imperfect, but when you bite into it there’s so much substance. We’ve mashed pretzels all the way through the soft serve and then dipped it in chocolate, so you can’t tell what’s in there. You’re going to have to do a little work to figure out what’s on the inside, but to me it’s perfect. Any exciting new flavors on the horizon? Yes, that’s all I’m going to say. 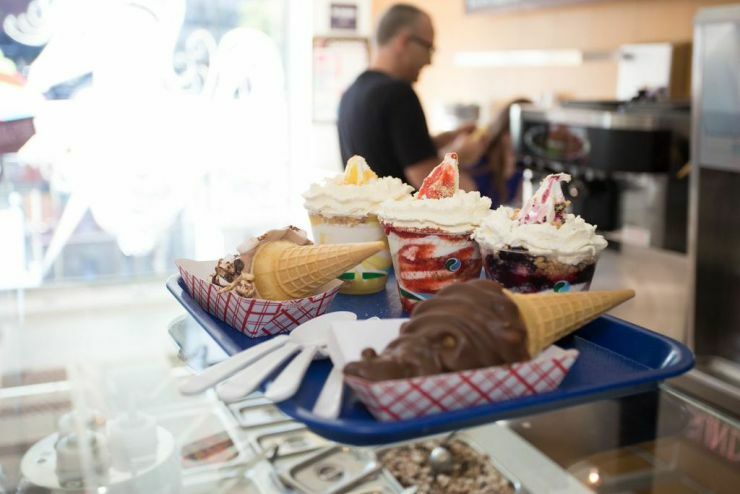 Why do you think New Yorkers can’t get enough of your ice cream? I think one of the things we have going for us is that it’s a whole experience. I’m not saying they come to us and we’re dressed in some sort of soda jerk outfit, but I do think we try to earn people’s money from the moment they come in the door to the moment they leave us. We really try to make them have a great experience with ice cream because ice cream is the funniest thing there is to eat, and every ice cream parlor should be as fun as possible.